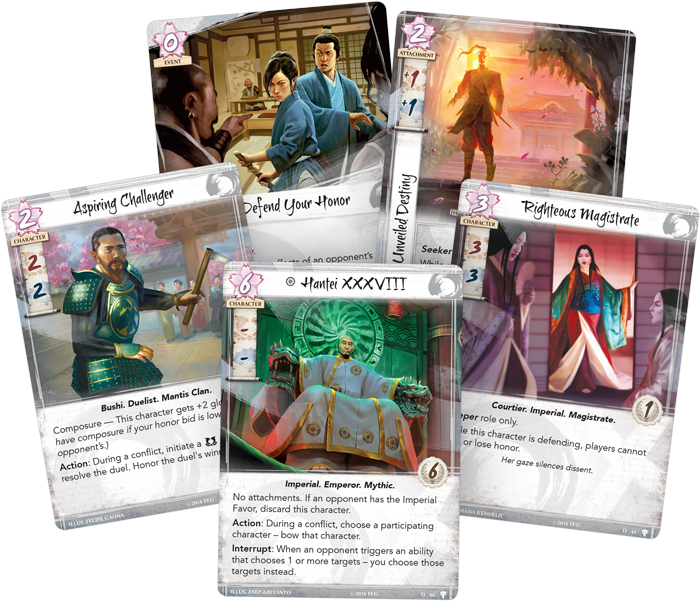 While the Great Clans are often the focus of Legend of the Five Rings: The Card Game, they are but a small part of the Celestial balance holding the Emerald Empire together. Minor clans, Imperial families, and Emperor Hantei XXXVIII himself all have a role to play in the conflicts to come. 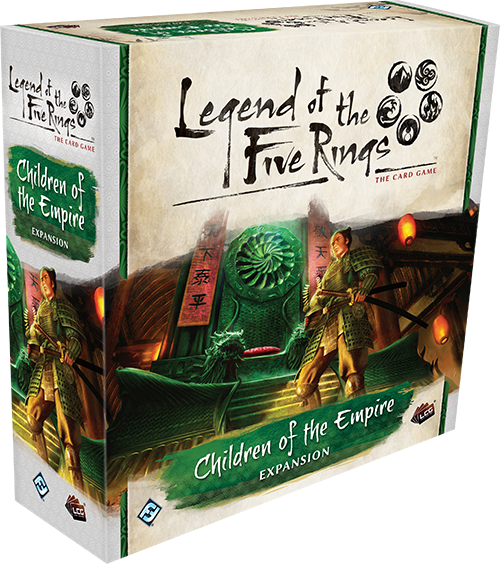 Children of the Empire is the first Legend of the Five Rings: The Card Game Premium Expansion, featuring a massive influx of 234 cards (three copies each of 76 cards and one copy each of six cards) spread across all seven Great Clans, making Children of the Empire the perfect next-step for new players and veterans alike. The neutral cards included in this expansion can be used by any clan, and can completely change how conflicts play out. 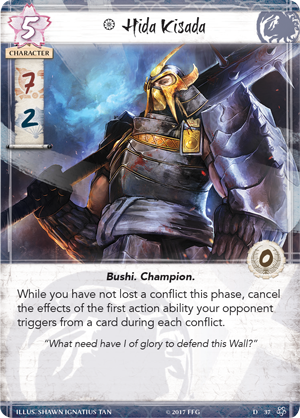 Join us today as we preview the neutral cards in Children of the Empire, a new Premium Expansion for Legend of the Five Rings: The Card Game! While the Great Clans' differences in philosophy can lead to conflict, they all serve the same master. Everything they do is in service to one man, the Son of Heaven himself, Emperor Hantei XXXVIII (Children of the Empire, 46). Naturally, when the Emperor himself is involved in a dispute between clans, the whole dynamic of the fight changes. With a – in both military and political skill, the Emperor will never join a conflict. Instead it is his influence that affects disputes, commanding an opponent’s character to bow, or choosing the effects of triggered abilities. This amount of control over the Empire can give you a monumental advantage… but of course, should your opponent gain the Imperial Favor, the Emperor leaves your side. But that will be surely be difficult to do when you consistently have six standing glory on the field from the Son of Heaven alone. The Emperor may not directly lead to you winning conflicts, but the support that he provides forces your opponent to fight uphill as their best characters are bowed and their triggered abilities become useless. 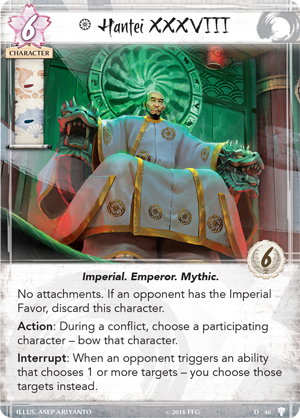 The Emperor isn’t the only Imperial card in Children of the Empire, as two new Magistrates dictate new terms of conflicts. The Humble Magistrate (Children of the Empire, 43) can only be used by Seekers, and prevents characters with printed cost four or higher from adding their skill to conflicts in which he is attacking. This can prevent some of the most iconic characters in the game from defending their provinces. 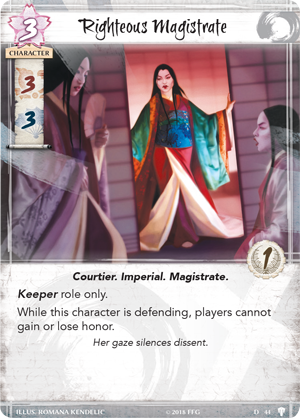 Stalwart champions like Hida Kisada (Core Set, 37) stand silent, and the blade of Matsu Tsuko (Children of the Empire, 24) falls dull against the sacred words of the Humble Magistrate. 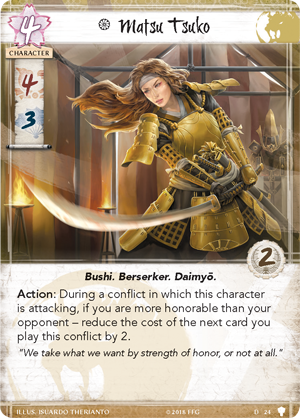 If your opponent is going to successfully defend in a conflict, they will have to rely on their lower-cost samurai to get the job done. Keepers, on the other hand, get access to the Righteous Magistrate (Children of the Empire, 44), who prevents honor gain or loss during her conflicts. While this does not affect who can or cannot participate in conflicts, an increased emphasis on the exchange of honor in Children of the Empire makes Righteous Magistrate a valuable ally. With the Righteous Magistrate on your side, you can always ensure your honor remains intact. Seekers and Keepers also get support in the conflict deck with Children of the Empire. 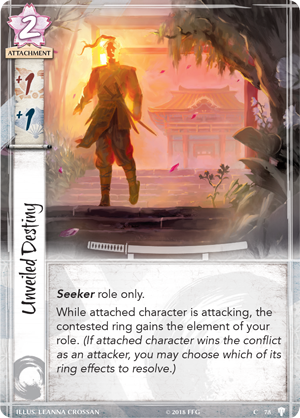 Unveiled Destiny (Children of the Empire, 78) is a Seeker attachment that lets you control the flow of destiny, granting the element of your choice to a contested ring while the attached character is attacking. In this way, Unveiled Destiny lets you choose the ring that with the most fate on it, and then add the effect you most need. This mixing and matching has potent effects, and with Unveiled Destiny, no ring effect will ever be denied to you. 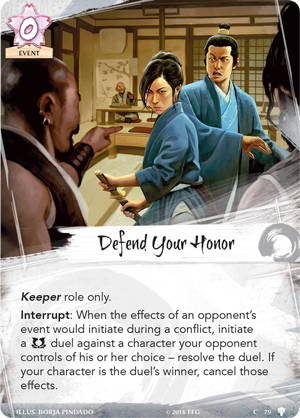 Meanwhile, the Keepers gain access to Defend Your Honor (Children of the Empire, 79), a military duel that can cancel your opponent’s events. Your opponent will get to select their own champion, so your timing must be precise, but with no real penalty for losing the duel, your opponent must decide how important their event is, and it may be an easy way to sap honor away. Of course, with the new support that Duelists receive in Children of the Empire, a proper field can see Defend Your Honor become a near-unbeatable card. The conflicts rocking Rokugan threaten to swallow the minor clans of Rokugan whole. But in this chaos, one clan sees opportunity: the opportunity to ascend to the status of a Great Clan and become something more. 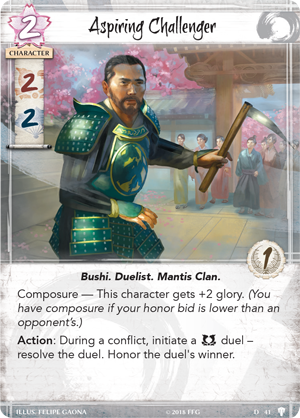 The Mantis Clan have slowly gained support in Legend of the Five Rings: The Card Game, and that trend continues in Children of the Empire. The Aspiring Challenger (Children of the Empire, 41) is the Mantis Clan Duelist featured in the Challenger cycle, with the winner of his duel becoming honored. While this can boost the challenger to three military and political skill, having composure can boost these skills even further, making an honored Aspiring Challenger a powerhouse that Yoritomo himself can be proud of. While the Great Clans continue to fracture Rokugan, the Son of Heaven and the Imperials must hold it together. But in this chaos, the Mantis Clan see opportunity. Will you stand with these neutral characters in the conflicts to come? 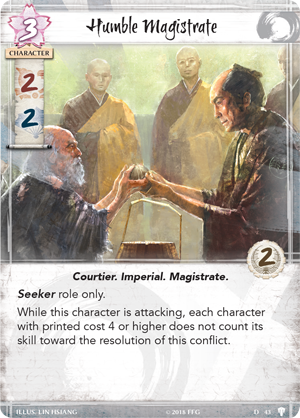 Celebrate Rokugan with Children of the Empire (L5C16), available now for pre-order, just talk to any of our Wizards today!